A 1.6 mile section of the Superior Hiking Trail between the 100 mile race start (Gooseberry Falls State Park) and Aid Station 1 (Split Rock) has been permanently closed and is pending a permanent reroute. We were holding out hope that the new permanent reroute would be in place for this years race but we have received official word from the Superior Hiking Trail Association that this will not happen until 2017. As a result we will make use of the Superior Hiking Trails official reroute on the Gitchi Gami State (paved) Bike Trail which parallels Highway 61 and Lake Superior JUST AS WE DID FOR THE 2015 RACE. The net effect of this reroute is that the first (approx) 4.5 miles of the 100 mile race will be on the bike path to the Split Rock River Wayside where runners will cross safely under Highway 61 using the “box culvert” to reach the Split Rock Wayside parking lot and the continuation of the Superior Hiking Trail – at this point runners will have approx 4.5 miles on the SHT / SplitRock River Loop to Aid Station 1 / SplitRock. The overall distance from the race start (Gooseberry) to Aid Station 1 (Split Rock) will be approximately .6 miles shorter than the original route and the overall length of the race will be approximately .6 miles shorter. 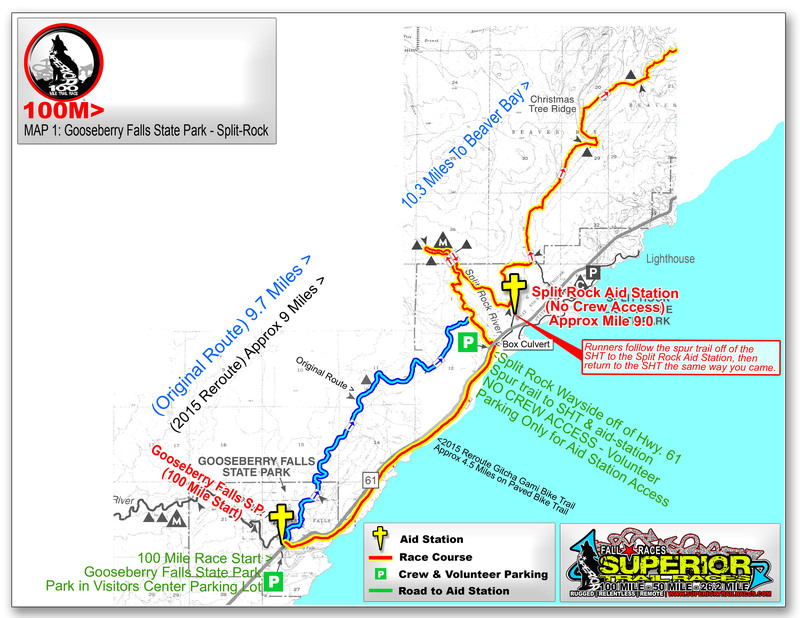 As in years past there is still no crew access for crew or spectators at the Split Rock aid station and no crew or spectators should go to the Split Rock River Wayside, there is just not enough parking to accommodate normal non-race-related day use along with race crew and spectators. After last years race this reroute was praised by the majority of veteran runners that we heard from, many saying they actually preferred this start as it allowed for a more spread-out / relaxed start to the race… heck, you still get about 98.8 miles of single-track! Note that this change has no effect on the Marathon or 50 Mile Race. *A note regarding course record attempts in 2016: A new men’s overall course record was set using this same re-route last year – since this reroute does add pavement and less hills the course record time was weighed carefully against several factors including overall finish time / time under previous CR, overall course conditions, weather etc. After considering these factors the performance was designated as an official course record – the final decision was at the discretion of the Race Director and the Superior 100 Mile Trail Race Board of Directors. Any time run faster than last years men’s course record will automatically be ratified as a course record. On the women’s side (since no new record was set in 2015) if the fastest ever time is run, it will be subject to the same criteria and a decision will be made after the race.